The AT&T Cotton Bowl game (named by its title sponsor AT&T) is an annual college football bowl game in the post-season and takes place in early January at the Cotton Bowl Stadium in Dallas, Texas. 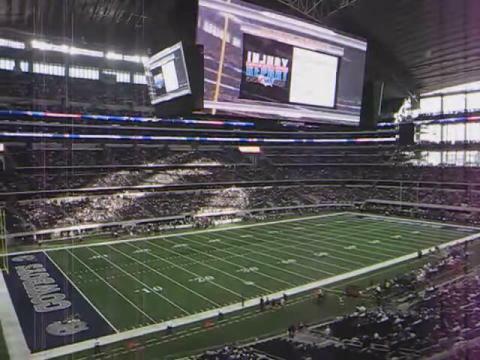 However, starting in 2010 the game was moved to the Cowboys Stadium in Arlington, Texas. The Bowl is one with the long and distinguished history. The very first time it was played was over 70 years ago - in 1937. Through 2008, the Bowl was played on New Year's Day (except in 2000 and 2006, when January 1 fell on a Sunday; the game was moved to January 2 in those years), before the decision was made to play this Classic bowl game to January 2nd for good. Conference Tie-ins of the Bowl are the Big 12 and the SEC. Starting in 1996, the game has been driven by the Big 12 Conference. In the late 1990s the opponent came from either the PAC 10 (Pacific 10) Conference or the WAC. Since 1999, however, a team from the SEC (Southeastern Conference) - usually a Western Division team like Mississippi) were matched up in the game. In 2010 the following teams will be matched-up: The Oklahoma State Cowboys, representing Oklahoma State University (OSU) from Stillwater, OK in the Big 12 Conference vs. the Mississippi Rebels, representing the University of Mississippi, Oxford, MS in the Southeastern Conference Western Division. The title sponsor since 1996 is AT&T (NYSE: T), which is the largest provider of local, long distance telephone services in the United States, selling phone service, DSL and high-speed Internet access and digital television. AT&T is also the second largest provider of wireless service in the United States, created in 1995 when SBC Communications Inc. bought AT&T Corporation. The Bowl Classic was always played in its own stadium in a suburb of Dallas, TX, but in 2007 it was announced that the Bowl will be featured at the Cowboys Stadium in Arlington, TX starting with the 2010 game. The main reason for this move was that the old stadium was an open-air stadium and it is often quite cold in Dallas in the beginning of the year. With a move to the indoor, and MUCH larger, Cowboys Stadium, the officials of the bowl were hoping to also secure the location for a future BCS bowl, which will probably not happen until at least 2015. Coming to the new stadium, however, was a great decision, since it can hold way over 80,000 spectators - actually over 110,000 (with standing room), which is important to host BCS bowl games. Cowboys Stadium, as the name already explains houses the Dallas Cowboys for their home games. Buy your AT&T Cotton Bowl Tickets now before it is too late and be one of the tens of thousands enthusiastic fans in this great football stadium.